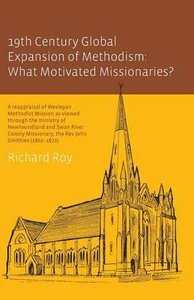 19Th Century Global Expansion of Methodism: What Motivated Missionaries? A near death episode in the Rev John Smithies' earliest missionary work raises the principal question of this book, namely, what motivated Wesleyan Methodist mission in the first half of the nineteenth century? At first glance, the question may be answered simply: the quest to make Methodist converts or to Christianise indigenous inhabitants of newly conquered territories of the British Empire. However, in this reappraisal of Methodist mission in the century after John Wesley, a new perspective is explored, one which challenges these more common and simplistic interpretations. About "19Th Century Global Expansion of Methodism: What Motivated Missionaries?"